Shelley McLoughlin has been making or creating ever since she can remember! In the 80’s she collaborated with her husband on several computer games as well as an accompanying book for one of the games. After having two children she returned to her first love of beads and began creating jewellery in the early 90’s. She has been hooked on jewellery and bead creations ever since. Shelley is self taught with no formal training. Having learnt how to make jewellery mainly through books and the web ‘The Internet has been a great source of inspiration and knowledge. It is a wonderful place full of sharing people, and I have made many friends through my love of polymer clay.’ She has also attended some classes through the British Polymer Clay Guild. Shelley is a committee member of the British Polymer Clay Guild. 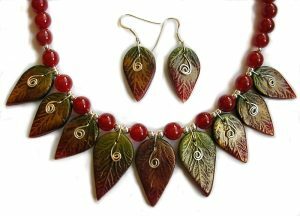 She is also active on several on-line clay and jewellery related communities.